The last trip on the San Francisco shopping excursion deserves its own post! Mena took me to the Lacis Museum of Lace and Textiles. I remember when Mena did a review of this amazing place on her blog and thinking how great it would be to eventually visit it! The store and museum are beautifully laid out! 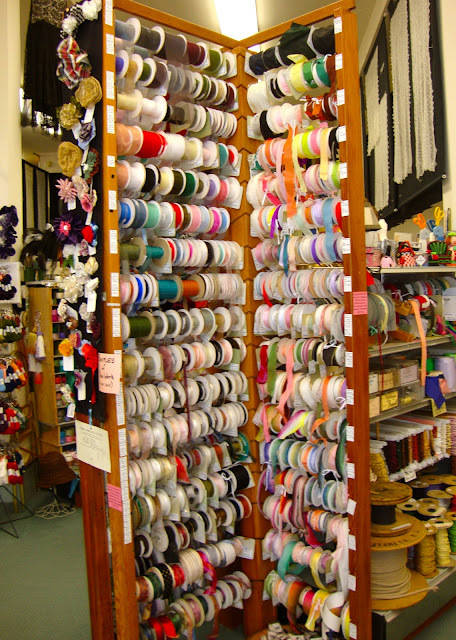 There are so many different types of ribbons, trims, hat supplies, lace, patterns and books! You can also buy all sorts of vintage and new lace and see how lace is made! I really love the antique feeling of the store. Aren't the lace umbrellas in the photo above beautiful? Mena and I were ooohing and ahhing over them! So, what did I decide to take back to Scotland with me? I was practically reduced to hysterics when I saw the appliques they had! I decided to get these two lovely dark purple appliques which I want to use on a 1940's style dress! Another 40's inspired piece is this adorable sequined bow that closes in the centre with hooks and eyes! Wouldn't this be a fantastic closure on the back of a dress? Or a cape? soooo cute! I also found this adorable pattern for sequin designs for only $2! Great deal! I loved Lacis too when I went there several years ago. Glad you enjoyed it's charms too! Oh the appliques are beautiful! I'd have been sorely tempted by one of the parasols though... Ah, it makes you wish for stores like that here in the UK doesn't it? Your time with Mena has been so fruitful! What lovely finds you've ended up with and what a great time you must have had doing it too!!! Oh God! The place looks like a Mecca! Wonderful! WOW!! It's the Shangrila of lace! I love what you've chosen - it must have been nearly impossible to select those appliques! such a lovely looking store! Wish I could have seen it in person! AMAZING! I was in San Francisco a few years ago for work... I loved the city and wish I had more time to explore! I think that store looks like my idea of heaven.. lace everywhere!!! Did you make it to Britex Fabrics? That's my SF must-visit. I didn't spend nearly enough time there when I actually lived in the Bay Area. Lacis looks pretty wonderful as well. Wow these places look amazing! Wish we had something like this in the UK. Went to San Francisco once and loved the place, but never knew to visit these stores. Gorgeous purple applique and umbrellas. Boy, I wish I'd done more recon before I went to SF a few years ago. I love the idea of using the bow with the hook and eye closure on the back of a dress - so feminine! Oh I love those appliques you found to take home to Scotland! Fun place for you to visit that's for sure. The appliques you found are lovely! I have heard about Lacis before, but those photos make me really want to visit! I can't wait to see what sort of wonderfulness those appliques get onto.